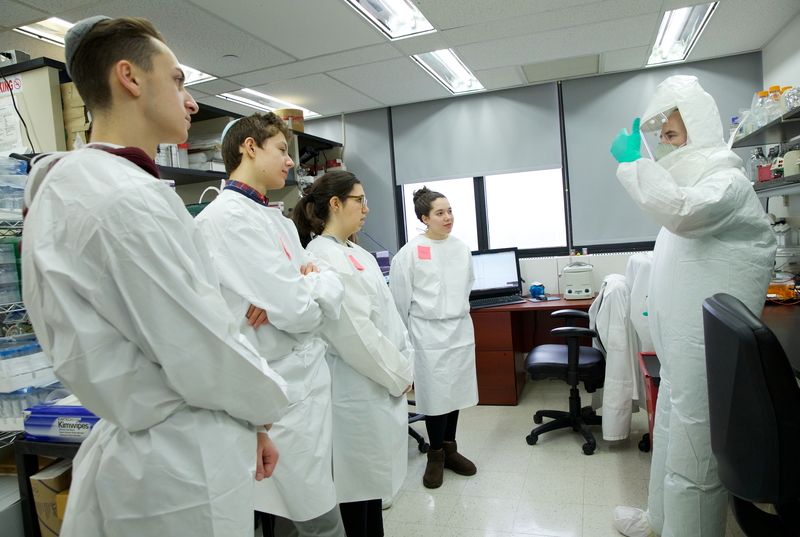 One of Dr. Rotenberg's 10th grade chemistry classes toured labs of the Microbiology Department at the Mount Sinai School of Medicine that specializes in viruses. In the lab they do basic research on viruses, work on vaccine development, and investigate the use of viruses for gene therapy. The visit began with an introduction from Dr. Adolfo Garcia-Sastre, the Director of the Global Health and Emerging Pathogens Institute, who gave an overview of the research conducted there. The class was divided into three groups and had the opportunity to visit three different labs and learn about a career in a biology lab. In one lab, students used pipettes to mix chicken blood cells with engineered viruses. In the second lab, they learned from Dr. Randy Albrecht about the protective suits he wears when working with more highly infectious pathogens and had an opportunity to try on the suit. In the third lab, they saw gel electrophoresis with engineered DNA. After the lab tours, Director of the Institute, Professor Peter Palese, recapped the visit and explained the importance of experimenting with viruses and vaccines. He showed a video of Bill Gates describing his biggest fear: an outbreak of another great flu, like the Spanish Flu of 1918-1919 which killed 20 to 50 million people.